In 2017, Redlynch Players performed the world premiere of Miss Read’s Thrush Green, adapted for the stage by Ron Perry, receiving critical acclaim. Set in a small village in the Cotswolds, Thrush Green tells the charming tale of one significant day in the life of its villagers - the first of May, when the annual travelling fair visits the village green. 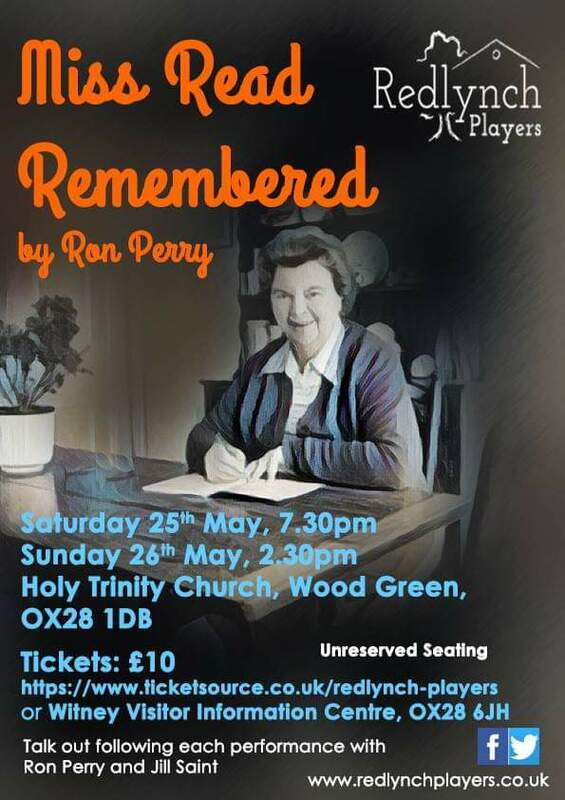 Now, sixty years since Thrush Green was first published, the Redlynch Players are thrilled to be bringing Miss Read Remembered to Thrush Green itself. Miss Read Remembered by Ron Perry will be a theatrical journey through the life of Dora Saint (Miss Read) with the author's daughter as a guest performer. Join us for a celebration to remember the author of the book and relive the charming story of Thrush Green. A talk out with Ron Perry and Jill Saint will follow the performance. Redlynch Players is a drama group based in Lover, Wiltshire, and have been bringing a diverse range of theatre to local audiences since 1957. Beyond their involvement in their local community, Redlynch Players are constantly striving to bring theatre to new audiences. Most recently this took them to the Holy Trinity Church, Corfu with a production of We Were There and they are now thrilled to be bringing Miss Read Remembered to Witney.